This Wheelchair Crutch Bag is a large carry bag with a deep pocket suitable for crutches and walking sticks that fastens to your wheelchair. With an extra large storage capacity of 27 litres. 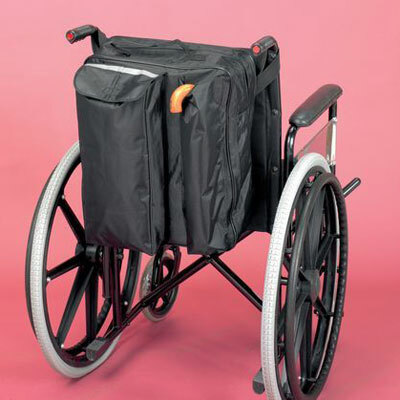 This Wheelchair Crutch Bag is a large carry bag with a deep pocket suitable for crutches and walking sticks that fastens to your wheelchair. It has side pouches that holds two crutches or walking sticks. With an extra large storage capacity of 27 litres. Maximum safe load 7kg. Bag Size 16 x 18 x 5½"